Timothy Magaw of Crain’s Cleveland cited the ERC survey in this week’s issue of Crain’s noting, “Even at the recession's peak, the region's workplaces didn't altogether banish their holiday parties. But as the recession's grip loosened, these same companies appear to be spending more on their end-of-the-year blowouts.” More specifically the data shows that of those organizations that are spending more in 2012 to celebrate the season the average budget increase is 25%. 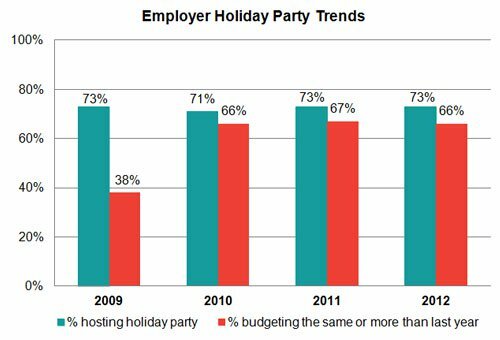 As the figure above illustrates, the consistency from year to year both in terms of those hosting a holiday party and the budget for that party is perhaps the most striking feature of the data. Despite so much talk of uncertainty in the business community, the 2012 data strongly suggests that Northeast Ohio employers are committed to creating and maintaining a great workplace for their employees. While it may seem like a small gesture, the fact that area employers are taking the time to make the holiday season something special for their employees is something to be celebrated.